« Carbohydrates or Fat: Which One Makes Us Pack On the Weight? It’s been a while since I last wrote about running. Truth be told, I haven’t had that many runs in the past couple months due to an injury – plantar fasciitis, a true runners’ nemesis! – but things are slowly getting better. I’m back to running 3-5 miles a couple times a week. On top of that, I was running to the gym and back (2.5 miles total) a couple times a week while we were in Alabama, so I can’t say that I’ve been slacking in the exercise department. As I’m trying to get my running edge back while painfully massaging my foot with a tennis ball, I’m looking forward to the time when I become brave enough to sign up for races again. This time it’s going to be in our new home in Washington state where we’ve just moved. New races! New PRs (hopefully)! And one more year before I enter a new, much more competitive age group. Today I’d like to share with you three super easy tricks that have helped me run more comfortably for a few years now. I’m quite stringent when it comes to shelling out money to buy another fancy running-related gadget/accessory, so I’ve successfully used these tricks through training and running both of my marathons and beyond. Making your running more enjoyable with these tricks is not going to cost you anything – most likely, you have everything you’ll need at home right now! In addition, you can feel good about not paying for more junk that’s likely going to end up lying around your house anyway. Savvy runners, rejoice! 1. 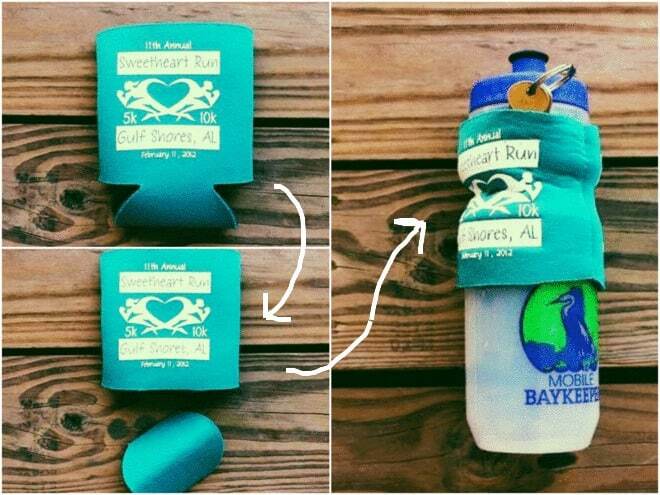 Use a beer koozie to hold a cold water bottle and stash away your keys/gels, etc. I’m one of those runners who always brings a water bottle with me while running. As convenient as it is for when I get thirsty, it’s often uncomfortable to carry a bottle covered in condensation from the cold water inside, especially on a hot day. Holding an icy-cold object in my hands for any length of time is not the most pleasant thing in the world. Plus, what do I do with all of the little things like keys or gels that I have to bring with me on longer runs? Here’s where a little industriousness goes a long way: cut off the bottom from any of those free beer koozies that are often distributed as freebies, and use the koozie as a sleeve for the water bottle! 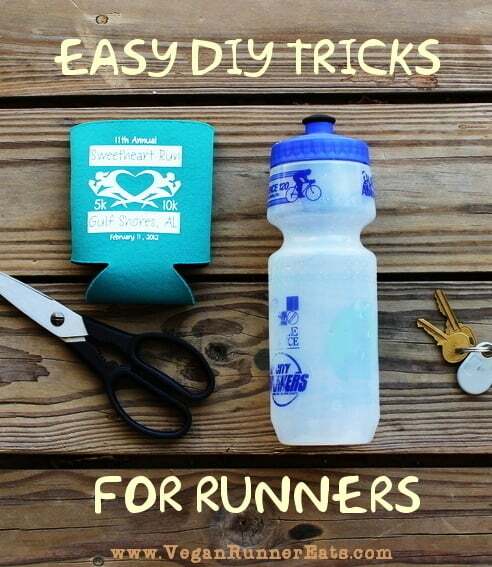 There are all kinds of accessories for running bottles out there, and some of them have little pockets for your stuff. But why pay for them if a beer koozie does the job for free? (Ugh, I’m not a fan of this word. Koozie? Who even came up with it?) You can stash whatever you want between the koozie and your water bottle – that’s what I do with my keys so that not to be annoyed by their dangling in my pocket. 2. 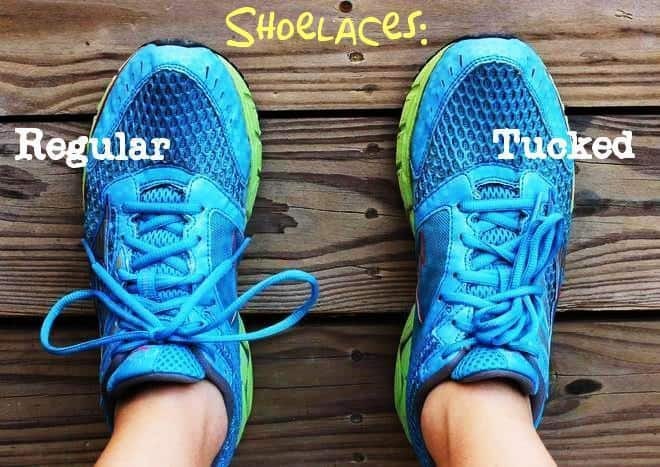 Tuck your shoelaces and never worry about them coming untied during a race. Anyone who’s owned more than one pair of running shoes has battled with the shoelaces in some models coming untied when it’s least needed. I struggled with that during my second half marathon back in the day – man, I must have stopped at least five times to retie my laces! Since then, I’ve been diligently tucking my laces (see the pic below) every time I head out for a run, and never once did I have to struggle with aggravation again. I mean, who needs to spend money on nifty shoelace holders if the same result can be achieved for free? Plus, the shoelace loops aren’t going to keep smacking your ankles with every step. Even the flimsiest of shoelaces won’t bother you if you tuck them in! 3. Pin sports gels to the waistband of your running shorts (skirt, pants, etc.) with a safety pin when going for a long run. Once again, why splurge on a fanny pack or a vest with pockets to hold sports gels if we can carry them on the cheap? I think I’ve heard about this tip from one of the editors of Runner’s World magazine who suggested bringing your own gels to a long race so that not to rely on whatever the race organizers are providing. Genius, I thought, so now I always bring my own food to eat during races. All right, these are just three little tricks that have helped me “save money, run happy”, but this list doesn’t have to stop here! Do you have any running tricks that have helped you run more comfortably? Please let us all know in the comments! Like this post and want to to see more ? Stay in touch with Vegan Runner Eats by subscribing in the top right corner of this post, or by following us on Facebook, Twitter, and Instagram! Tagged money saving tips, running, running shoes, running tips. Bookmark the permalink. Definitely planning to use #2 and #3. Your genius! Thanks for sharing! Awww thank you Kristin, hope these tips work out well for you! The lace-tucking idea is sheer genius! It actually works! Yesterday I greatly enjoyed hiking without constantly having to retie my boot laces and I’m looking forward to using this technique with Zumba shoes. Many thanks and safe travels. Awesome, glad you liked this tip, Molly! And thank you for the good wishes, we’re already in WA, supposed to move into our new home in a couple days. Just started running and every little bit of information is helpful. This was a great article. Thanks for sharing. Great job Rachel, good luck on your running journey!